Most of us will never have the opportunity to attend a Nobel Peace Prize ceremony. All of us attending NAFSA conferences, however, have had the good fortune to hear Nobel Laureates speak at plenary sessions. If you are like me, you were inspired by words from past Laureates such as Shirin Ebadi or Wangari Matthai--two of my favorites. This year in Denver, we are again fortunate to have a Nobel Peace Prize winner on the plenary schedule. The Friday event will feature 2014 Nobel Laureate Kailash Satyarthi who shared the prize with Malala Yousafzai. While Mr. Satyarthi's story has not grabbed the type of headlines—or tugged at our heartstrings—the way Malala's has, for the past 35 years he has committed his life to the betterment of children's lives. The Nobel Peace Prize committee recognized his work in India, along with Malala's in Pakistan, "for their struggle against the suppression of children and young people and for the right of all children to education." Mr. Satyarthi's foundation is dedicated to ending child labor and slavery in India. According to his foundation, a 2011 India Census report documented more than four million working children from ages 5 to 14 in India. The number is staggering and should give us pause when we realize that these issues affect not only children in India but also in many other countries. Mr. Satyarthi recently vowed to end child labor and slavery in India during his lifetime and I look forward to hearing his plans. Like me, many NAFSANs have witnessed child labor while visiting countries such as India, or we have had children in our communities who escaped their lives as child soldiers or other types of enslavement. I shall forever be haunted by the eyes of a child not more than 10 in a West African country where I was working on an election project. The young boy was not in school like other children I saw walking into school buildings in their uniforms with books in tow. Instead, he was working on a truck engine and behind him were two other young children who were sorting pieces of mosaic tiles for a flooring company. I couldn't help but think that given the boy's ability to repair an engine, he could excel if given the chance at an education. So I am eager to hear Kailash Satyarthi speak as our closing plenary at the 2016 NAFSA Annual Conference & Expo. His experiences will remind us that even if the calendar says 2016, there is still much work to be done to provide all children in the world with access to education. We may not be able to start a foundation as he has to help eradicate the problem. But his words will undoubtedly inspire us as international educators to keep doing what we do even if there are days when bureaucracy and individual students' problems seem too much. For each person we help educate in our own country's universities who then return to their countries where access is threatened, we provide an avenue for change. As have other Nobel speakers who faced great odds, he will also remind us that progress can be made. Awareness of a problem is the first step in changing the world. 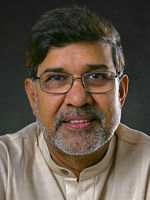 NAFSA plenary speakers such as Kailash Satyarthi provide the spark for our own actions to bring us closer to the safe and peaceful world we desire for all children. Diana Carlin recently retired as associate provost for graduate and global education at Saint Louis University. She will serve as a member at large on NAFSA’s 2016 Board of Directors.